A roll was made to the main channel Tuesday, #18.10.04.520268. All internal fixes. The three RC channels and Snack also got updates, #18.10.19.520868 for Blue Steel. Le Tigre and Magnum were not ‘determined’ as to which version they would get. Snack is getting an EEP update, 18.10.19.520844 (?). There was some mix up in which version of EEP was going out. Some little glitch in operations gave Rider Linden an opportunity to get a newer version of EEP on Snack. So, the 520844 version is probably not the version rolling out. That the region Denby (URL) is running Second Life RC Snack 18.10.20.520891, is a good indication 520891 is the version actually rolled. With the EEP viewer you can see EEP on the main grid. Grid Survey Milestone – You may know that Tyche Shepherd maintains a survey of regions in Second Life. You can find the latest information at GridSurvey.com. But, the milestone is the update published at SLUniverse, New SL Sims in past week. Daniel Voyager noticed the 100th post in a thread started in 2008. If you have ever wondered which regions are in a particular RC channel, Tyche provides the best information available. It isn’t a perfect list of RC channels as things change quickly. But, it is the best available. Posted in General News, Second Life, Statistics. Tagged Stats. Posted in Games - Other, General News, OpenSIM, Second Life. Tagged Stats. Posted in Firestorm, Second Life, SLV2, 3, 4, 5, & 6 Series, Viewers. Tagged Stats. Posted in Blog Stuff. Tagged Stats. Writing the annual review is a lot of work and takes time I will be using for RL projects. Ciaran and others have written their reviews of 2014. I’m going to skip mine this year. But, I do have some thoughts on 2014 and the coming 2015. 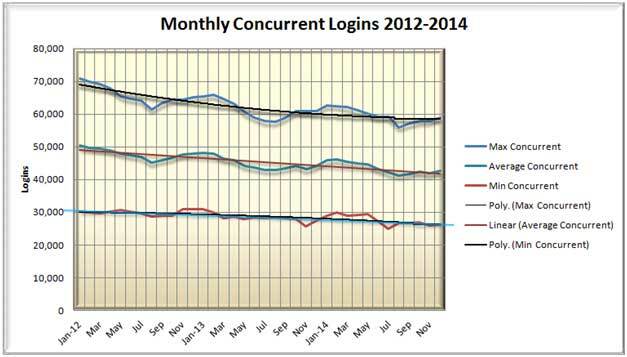 I have been tracking concurrent user numbers for the past 3 years. There has often been a discussion about whether or not there is a seasonal aspect to the use of Second Life. I think the chart answers that question. It shows most clearly in the peak concurrent users line and a bit less in the minimum line, but it is still there. Posted in General News, Second Life, Statistics. Tagged Annual Review, Stats. On Plurk I noticed Hamlet’s article: New SL User Retention is 20% (Wha?) I mentioned that stat in one of my ‘Rod Interview’ articles. Rod had said of the 400,000 new sign ups to SL each month 20% stay longer than 30 days. Stats – Do they Work? Hamlet was thinking about that and wondering about the numbers. Hamlet had thought about past numbers and remembered that previous monthly sign ins was in the range of 500,000+. If there are 1,000,000 sign ins per month now and 400,000 of them are new sign ups each month, Then that means SL has only grown to 600,000 over a number of years. How can 20% stay and not drive up the sign in count? That should add 80,000 users per month.